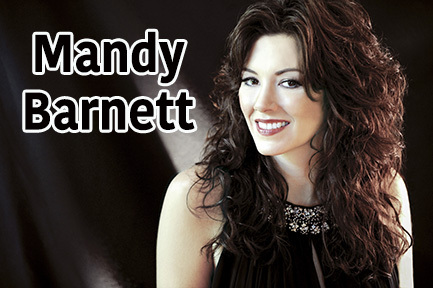 Mandy Barnett, a native of Crossville, Tennessee, started singing at five years-old. She has been singing since. Mandy’s style is rooted in the classic country and pop crooning of iconic singers and enduring sounds. She delves into a song with a keen interpretative sense, studying the intricacies of its emotional content and rendering a powerful performance through her full-bodied voice. As a teenager, Mandy starred as country music legend Patsy Cline in the stage show “Always . . . Patsy Cline” at the celebrated Ryman Auditorium in Nashville, Tennessee. The performances sold out nightly and received rave reviews across the country. Mandy, in role as Patsy, appears on the Decca Records cast recording. Mandy soon signed with Asylum Records where she released her first album as herself, appropriately entitled, “Mandy Barnett.” The album received glowing reviews in major trade publications and magazines, including “Time” magazine, as well as praise from veteran country artists and fans.